A stylish and classic fashion essential. 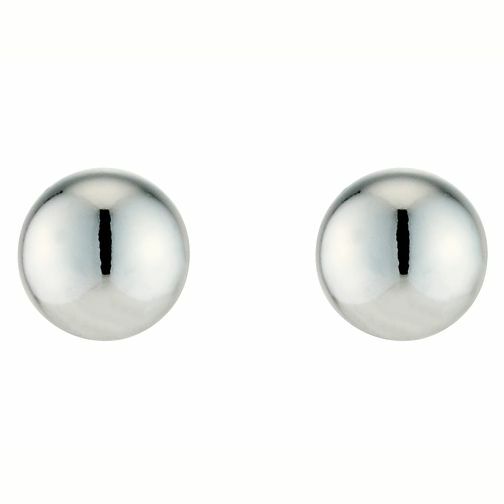 4mm ball stud earrings in 9ct white gold. 9ct White Gold Ball Stud Earrings is rated 3.7 out of 5 by 3. Rated 5 out of 5 by Anonymous from Well made and affordable These are just plain studs but well made and backs are too. Rated 2 out of 5 by Anonymous from Poorly Made When I first put the earrings in, I noticed that the fastener felt very loose. After 10 minutes, it had fallen out and I have had to replace with another fastener from another set of earrings. Very badly made and low quality. I normally purchase earrings from H Samuel and have never had this problem before.